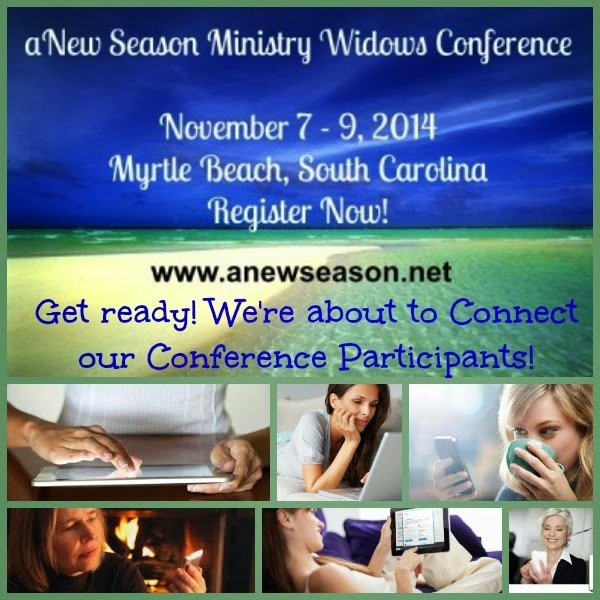 Widow’s Christian Place: Connect With Other Widows for November Widows Conference! Connect With Other Widows for November Widows Conference! I hope many of my readers will be able to attend this conference along with me! Let me link you to find out how the excitement is mounting---click here for the latest. Very soon, all who are attending will be invited to join a special Facebook group set up just for us to meet each other ahead of time! I imagine this will be very much like my Lifeboat groups which so many widows love. In a safe and confidential Lifeboat group you get to ask your questions, express yourself with women who "get it," ask for prayer, share your joys and victories, and yes---even the confusion and tears. Friendships form, faith is strengthened, and everyone longs to meet up "in person" someday. So the main difference between my Lifeboat groups and the aNew Season Widows Conference group will be that the conference group will be meeting each other at the conference in November! I'm excited! I hope I get to meet you! In fact, if you'll be attending this conference, please email me at WCplace@gmail.com and let me know, OK? I live only 2 hours away from the Springmaid Resort. If you're driving, maybe we can caravan or carpool. If you're flying, maybe I can pick you up at the Myrtle Beach airport. Or maybe we'll meet for dinner on Friday night before the evening session. Please consider going. I have to pay my own way too, (as do all the speakers) so I know you've got to dig deep into those pockets. But before you say you can't, please at least pray about it and see if God says you can because He will provide. I always have to remind myself of this: You have not because you ask not (James 4:2) I hope I haven't missed out on too many wonderful things in life because I assumed I couldn't do them and never even bothered to ask God about them.